It started with a coincidence. Basti posted a speech by the choreographer Royston Maldoom : “Don’t think we’re just doing dancing! 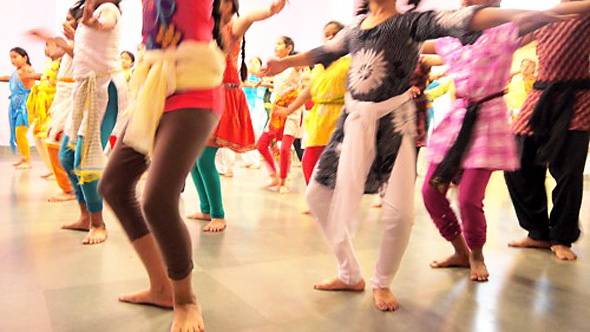 You can change your life in a dance class” on while I heard an intriguing, loud, and powerful music coming from the garden next door in Bangalore. Little did I know that I was about to be introduced to Yamini Muthanna, a well-known star in India and an award-winning dancer. Yamini is my friends’ neighbor, so Anil just brought me over to see her. A brief hello and the lady of the house directed me towards a sofa: “Sit! Sit! Please watch and listen!” and continued the dance she was doing. 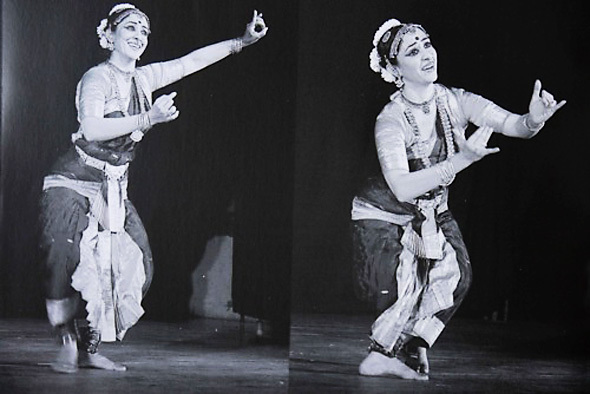 I don’t like folklore, I thought, but her moves, gestures, her face and her posture were just mesmerizing. 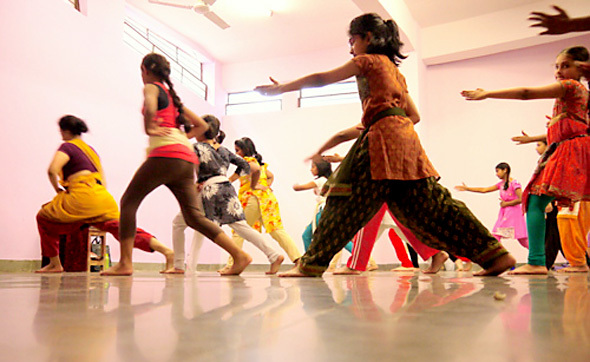 Yet what fascinates most is how Yamini conveys her art to young people. Both Royston and Yamini are what they do with each part of their body and soul. Their life is filled by dance, so they don’t just teach but actually pass on a true love of their profession. That’s what we need in learning and coaching: A close connection to the experiences and passions of those who do the things we are learning about! So we may see a new division between teachers and DO-ers: The teachers will be custodians of the curriculum, where their pedagogical expertise can really shine in organizing the learning. But in a new learning culture the direct touch with the passion and authentic experiences of DO-ers will need to be dramatically increased. 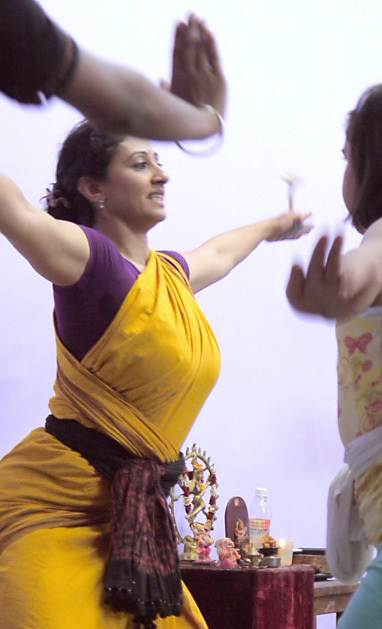 In dance, each move has a meaning and tells a story – especially in what Yamini does, the Bharatnatyam. There is a true language of the hands, similar to the sign language for the hearing disabled – but with additional grace and poetry. Hands and body, together with face expressions, are used to tell a story. You see a young woman following a butterfly over some colorful fields, but there is a tiger in hiding. A young man comes to rescue her – or was it a god? You feel fear and ferocity, fight and victory. The stories are fun and captivating by themselves. But when you dance the story, you embody it. Then it stays with you forever. This can be key for learning: Some of our teachers at Phorms would demonstrate how, for instance, the oxygen molecules circulate through the body by having the kids first draw a huge body on the ground with chalk and then they themselves are the oxygen molecules running through the lungs, arteries and veins – from organ to organ. This experience you never forget. This all sounds like fun so far. But Yamini is very exact and clear about what she expects from the girls: “If you are too tired to do it right, sit on the floor, rest and watch. Don’t allow yourself to do less than your very best!” And thinking back about all good teachers I had, I notice that the ones we admired and respected were exactly the most demanding ones. And this goes along with an element of play. If you play, you want to win, to perform; you want the satisfaction of being best at something. If your teacher requires that from you, you feel that he or she trusts you. “I know you can do better!” gives kids much more confidence than a “well done” – especially if it’s truthful and comes from the heart. Expecting perfection and quality is what moves each learner towards a better self. So, let’s take together a big step forward towards what moves us for better learning!